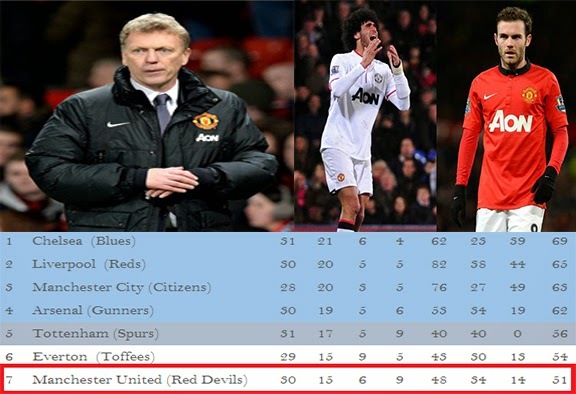 Should David Moyes Be Sacked? Should Moyes Be Sacked? All reasons and happenings that underwent in the presence of new Manchester United boss David Moyes. This pretty much speaks for itself, Manchester United have long dominated football in the United Kingdom lifting the Premier League title 20 times. The defending champions have been in dismal form this season breaking a few records at Old Trafford for all the wrong reasons. The Red Devils are used to winning titles but crashing out of the Capital One and FA Cups at premature stages to opposition currently in the bottom 6 of the Premier League table is just unacceptable for a team of United's calibre. When one looks at the players on the pitch they cannot help but notice that these players are wishing they were elsewhere. Motivation of players is an elementary part of the manager's job and his lack of player motivation is showing on the pitch. David Moyes over the last two transfer windows has acquired the services of Belgian midfield general Marouane Fellaini and Spanish playmaker Juan Mata for a combined total of about £65 million. Only the latter has shown signs of paying dividends on his transfer fee. One could argue the need of Fellaini seeing that United already have the vastly experienced Michael Carrick in that position and centre half Phil Jones who has often be utilised in that position. It is true that United have struggled for creativity this season and a player like Mata was needed but not at a fee of £45 million. During United's #AskCarrick twitter discussion, Man Utd's supporters highlighted one Tom Cleverley as an ineffective midfielder. The United officials went on to say that he was being used as a scapegoat. As the statistics suggest to some extent Cleverley has been responsible for The Red Devils' midfield woes with an average of 49.8 passes per game and 0.5 key passes per game compared 73.6 and 0.9 of Michael Carrick. The Man United gaffer's training methods which have been described by some a "military" and that the players feel tired heading into an encounter have been a large contributing factor to injuries to key players this season. Dutch talisman Robin Van Persie has had a recurring groin injury for a chunk of this year which coincided with an injury to fellow frontman Wayne Rooney resulting in a dry spell of goals for them. As United head into their next fixture they are without Chris Smalling and Johnny Evans both with different problems that can be linked to training methods. It is not so long ago that the boss blasted his charges publically and many who have studied football know that this more often than not has a negative effect on the player's morale. Noticeably after this incident they suffered a poor spell of football. It is a widely known fact that a managerial transition does not pay instant dividends and if given time the former Everton boss could reach the levels of success that the club's supporters demand season in season out. Having managed Everton for 11 seasons winning the manager of the year accolade 3 times is that fine spell, no doubt should be casted over his abilities as a manger. It is in that illustrious spell that "Dithering Dave" kept Everton in the top half of the Premier League qualifying for the UEFA Champions League in 2005 and reaching the FA Cup final in 2009. David Moyes brought Australian attacker Tim Cahill to Everton and went on to become the greatest Australian player to ever grace the world stage behind legend Mark Viduka. This just goes to show that he has a good transfer head on his shoulders and could bring in the talent that is so required to bring Man Utd to the hilt of English football. Bringing in a new manager at this point in time could further send United into a spiral that could destroy the good work, as little as that is, they have done this season. By bringing in a new manager United risk hiring one who is less competent and who could make this bad season worse. Reason being that the modern game is governed by money and as current form suggests the owners of the club stand to lose millions of hard earned cash. The fans of such a club with a rich footballing background do not have to stand for this because after all they have to go to their places of work and schools tomorrow after their team breaks a record at Old Trafford for all the wrong reasons.